(FLINT, Mich. – April 17, 2015) The Friends of the Capitol Theatre, a subsidiary of the nonprofit Uptown Reinvestment Corporation (URC), today announced that it has signed a purchase agreement with Capitol Theatre Building LLC (Farah Family) to acquire the historic Capitol Theatre building. The purchase agreement marks a significant step toward the redevelopment and reopening of the 2000-seat theatre as a first-class music and performing arts venue in the heart of downtown Flint. The renovation plan includes the 25,000-square-feet of attached office and retail space. The deal allows for up to one year for Friends to perform due diligence and put together the financial structure for the project. Ownership and operation of the Capitol will officially transfer to Friends once due diligence has been completed satisfactorily and closing occurs. Due diligence will begin immediately. If all goes according to plan, the entertainment venue could be ready for a grand reopening in the next 18-24 months. The Farah Family, which has owned the Capitol for 38 years, has worked to preserve and protect this wonderful and strategic community asset until the structure could be fully restored and redeveloped. 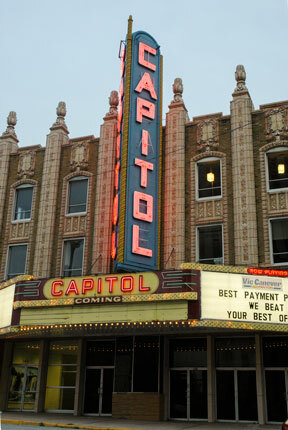 Designed by a noted theatre architect of the era and opened in 1928, the Capitol is an atmospheric theatre, creating “the impression of outdoor settings featuring ancient and exotic places inside the building,” according to A Guide to Flint Architecture, published by the Flint chapter of the American Institute of Architects. Outside, the exterior features buff-colored brick set off by terra cotta piers, colonnades and roofline cresting, common to 15th century Hispano-Italian Style, the Guide states. Herman said the historic theatre’s restoration creates significant opportunities for synergies with Flint’s outstanding Cultural Center. Farah also believes that the agreement between Friends and Capitol Theatre Building will create great momentum for the theatre’s redevelopment.